The Soup Lady is poised - as are we all - on the brink of another new year. Never one to leave things to chance, the Soup Lady has always believed in stacking the deck as much as possible to ensure that the coming year will be a lucky one. Believe it or not, it took a number of years before it became evident that feeding tuna fish and sparkling apple juice to small children who are all riled up from intense pot-banging at mignight was ill-advised. Finding two clean brooms suitable for indoor use was always problematic and the garage broom was pressed into service at the last minute, doing more harm than good, cleanliness-wise. The kids grew up, the accordian player moved away and some of the customs fell away. One ritual that remains is eating blackeyed peas at the stroke of midnight. Well not just one - the kissing and the drinking made the cut, too. Since the weather in New Jersey today is chilling dampness and dreary rain, what could be better than black-eyes peas in a soup? And if one bean is good, nine must be even better. Here is the way they treat the beans in Houston, courtesy of Dave, long-time Friend of the Soup, maker of Saurkraut Soup and Squash Geese, and host of Groundhog Day revelry. Prepare the beans by soaking beans according to package directions. In a large frying pan, cook the bacon until it renders the fat and bacon is slightly crisp. Remove the bacon pieces and add oil or butter to the pan. Surprise onion, peppers and garlic by throwing them into the hot fat. Add 1 tblsp salt, 2 tsps pepper simmer for about half an hour until soft and reduced in volume by half . In a large stock pot, add beans, consume and water along with sauteed vegetables. Simmer for 2 1/2 to 3 hours until beans are tender. Correct seasonings. Remove 2 cups of soup, blend and return to pot to thicken. Add tobasco and/or cayenne to taste for last-minute zing. Dear Soup Lady, This was last night's dinner. 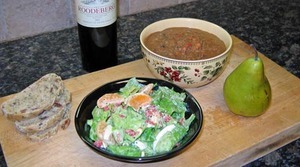 The salad is Romaine and Boston Bibb lettuce with Clementine Tangerines from Spain, chunks of aged stilton cheese, boiled egg white slices and bacon bits in poppyseed dressing. The bread is rye laced with prosciutto slivers. The wine is a hearty South African red table wine. I may have overdone the blending bit on the soup. I blended 3 cups of the soup instead of two. It is just a tad thicker than I intended but not pasty. I'm sure it's just fine, dear, but if the Soup Lady made this, 2 cups of beef consome would be replaced by chicken stock and there'd be a flurry of crushed red pepper flakes added. Happy New year!